The Children’s House program is designed to meet the developmental needs of children ages 2 ½ to 6 years. The class references the world’s first Montessori Preschool, called the Casa dei Bambini (House of Children in Italian). 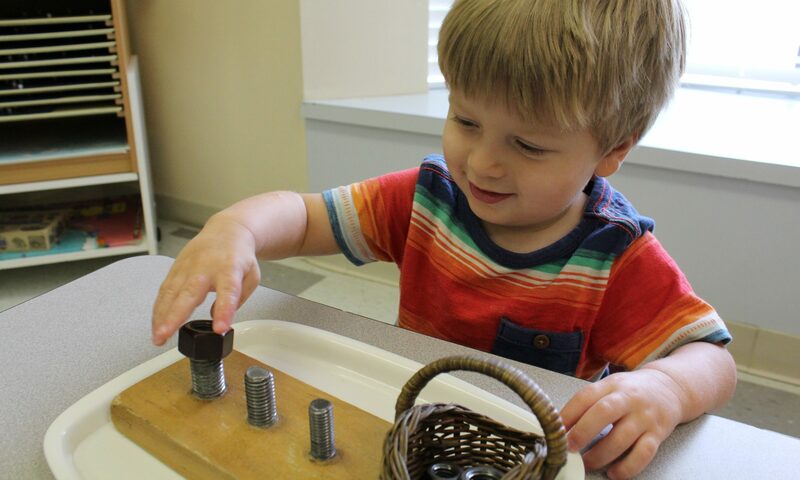 In the Montessori classroom, each child’s rhythm of growth is respected, while developing order, concentration, motor coordination, and independence. The school offers an unique educational program that lays a foundation for success in Kindergarten and beyond. Children master reading, writing, math, science, and cultural studies – while exploring skills in creative expression, critical thinking, and quantitative reasoning. Special emphasis is placed on developing soft skills, such as grace and courtesy, collaboration, and emotional intelligence. Children have access to special coursework in art, music, Spanish, and may participate in extracurricular courses, curated for Montessori families. On arrival, the child is guided to her classroom and later begins working on an activity of her choice. Students may choose activities from a variety of subjects, including math, language, geography, and science and practice their skills under the careful eye of the Montessori teacher. By age 6, students are challenged to master multiplication, skip counting, and advanced reading and writing. More importantly, students are encouraged to be holistic and critical thinkers, grounded in an appreciation of the natural world and global cultures, with patience, discipline, and focus. The work day concludes with outside play time, lunch, and nap time followed by another Montessori work period. Each classroom is equipped with its own restroom facilities, water fountain, and microwave. Students are served snacks, milk, and lemonade, and they have ample outdoor playtime. Students can participate in part-time or full-time programs. Programs are offered from 8:30 – 2:30 PM (Full Day Montessori) or 6:30 – 6:30 PM (Full Day Montessori and Extended Care) for working families. Special consideration is given to children starting school for the first time. Children must be fully independent in the restroom before starting in the children’s house.